The floor of this charming garden arbor looks to be crushed seashells at first, but it’s actually broken crockery tumbled to soften its sharp edges. 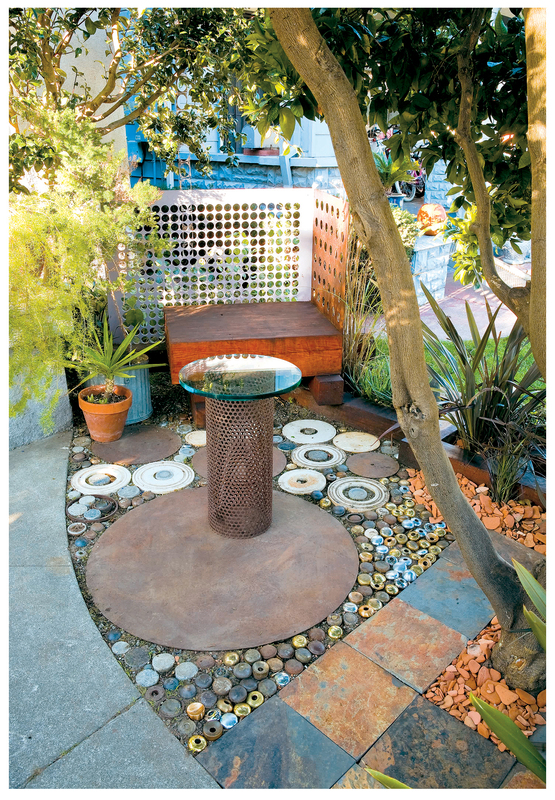 Table and bench bases are composed of ‘gabions’, or metal cages, used to create retaining structures when filled with stones. They’re topped with sheet glass and cushions respectively. 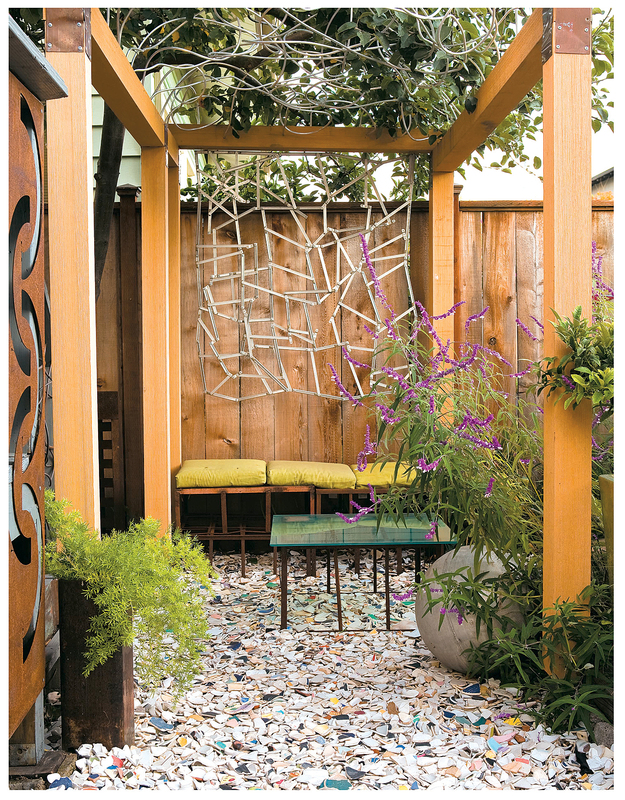 The stylishly angular arbor structure itself is made of timbers in a wood/plastic amalgam that doesn’t rot and is, at least partially, made up of recycled material. To the left, a screen of rusted steel ‘skeletons’ (the unused portion of a metal plate once shapes have been cut from it) leads the eye to the seating area. 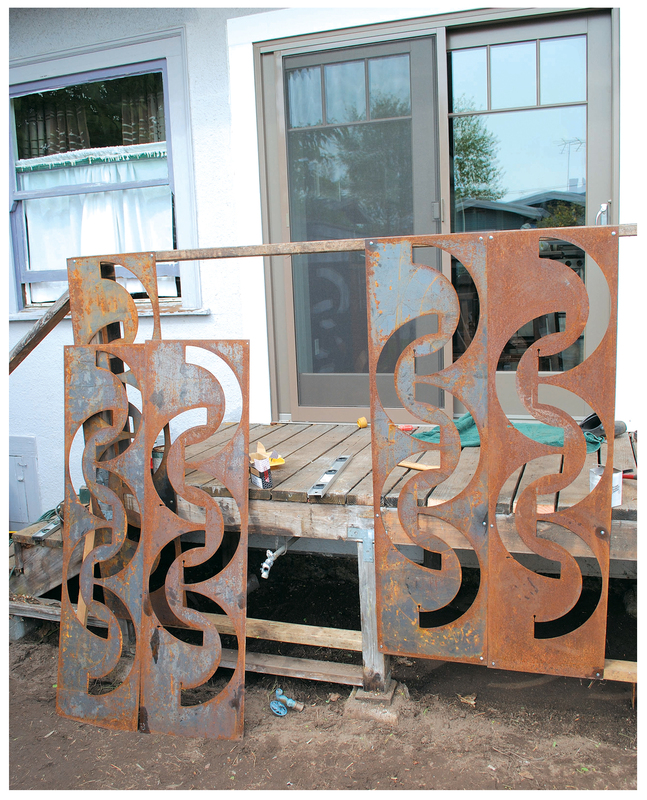 Atop the arbor, a vine-y tangle of aluminum tubing mimics the plants that will eventually cover it … at the rear, what was once a tangle of hard-t0-sell casement window hinges has become an abstract hanging sculpture. I love it all and would find relaxing here with a glass of wine quite satisfying. 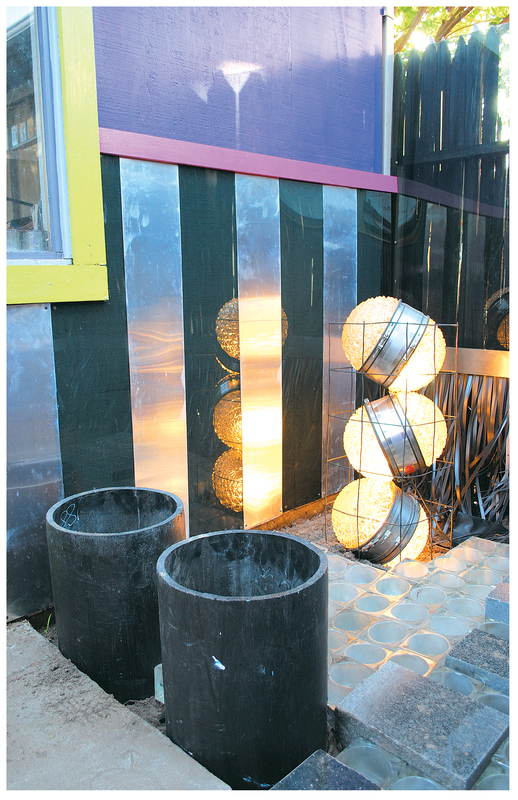 This colorful area takes on the warm glow provided by light orbs created from two unlikely-to-ever-meet sources: faceted glass light fixture covers and oversized metal plumbing hubs… that just happened to fit each other perfectly! Stacked willy-nilly into a metal cage they look like a million bucks, in spite of their salvage yard origins. Not all the projects in the box are as involved, or large-scale, as the previous ones. 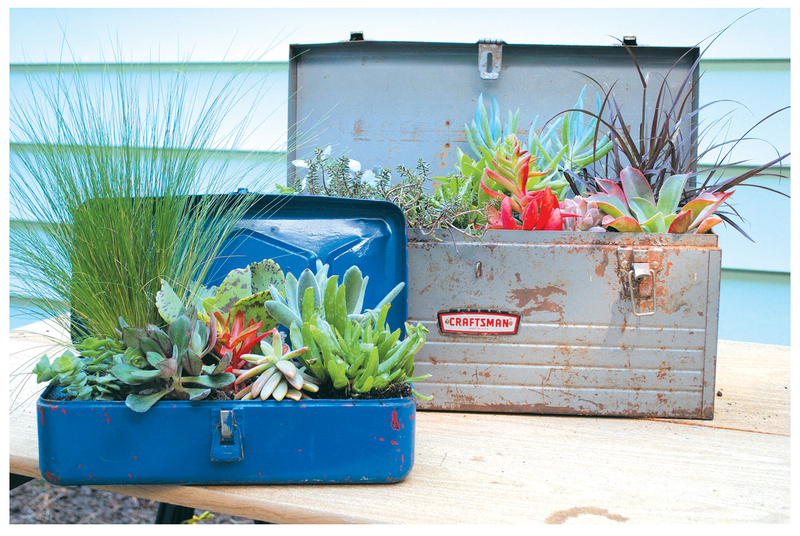 These simple metal tool or tackle boxes, the kind easily found at rummage sales and flea markets (or, in your own garage), have been put to clever use as interesting planter boxes for succulents. So manly, right? 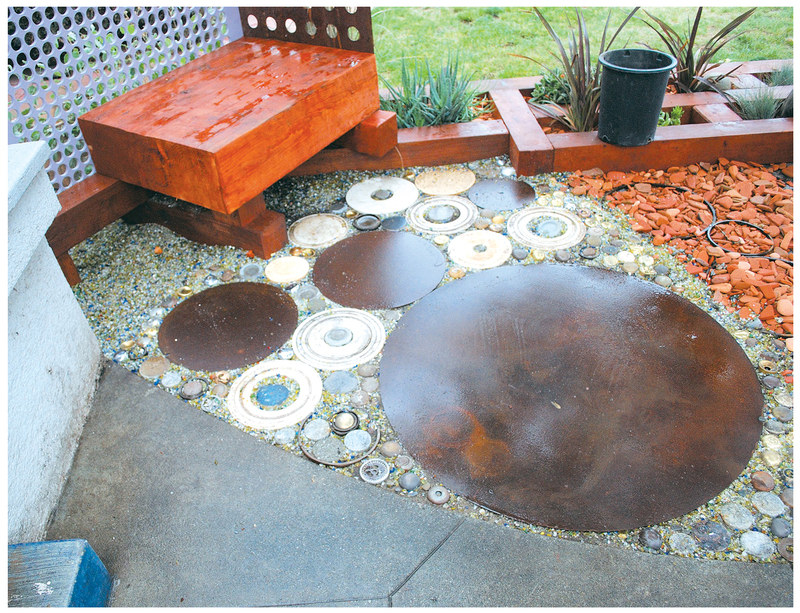 Also attractively simple, but not shown: rain chain projects using discarded keys and other metal bits. 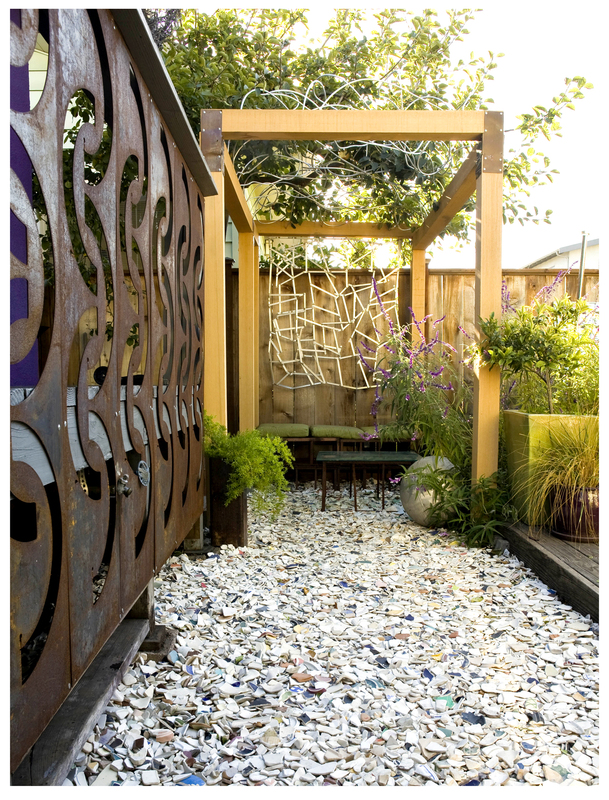 Levesque accomplishes something really great in ‘Yardscape’: he allows us to see things that would normally be discarded, or go unused, in a different way … to see possibilities. 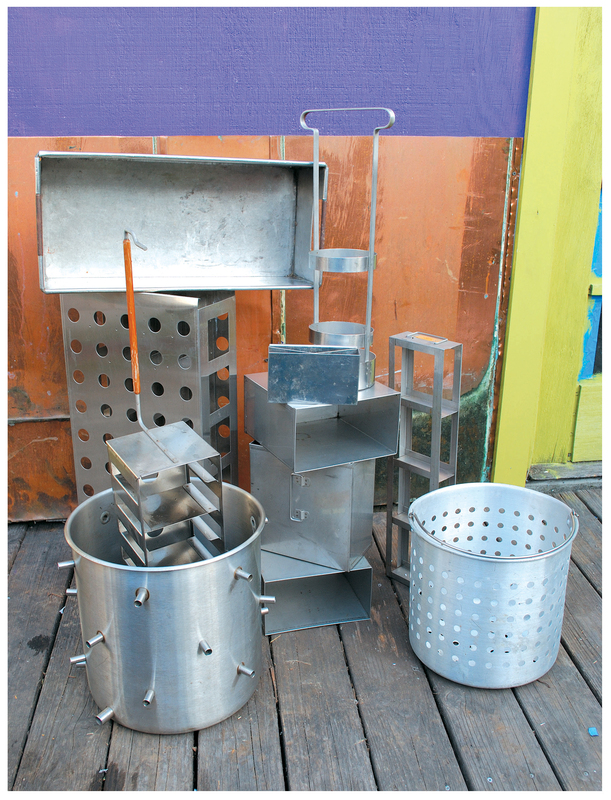 A good example is this group of stainless steel items from a restaurant supply house. I admit I’ve seen these things in a warehouse and passed them by; I have enough pots and pans after all … but after reading Levesque’s list of possible uses for them, I now see them as garden accessories, storage items, shelving and planters. An added plus: these items have the same elegant look of high-end designer accoutrements for your garden, without demolishing the budget. All it takes is imagination and allowing yourself the time to see their possibilities. 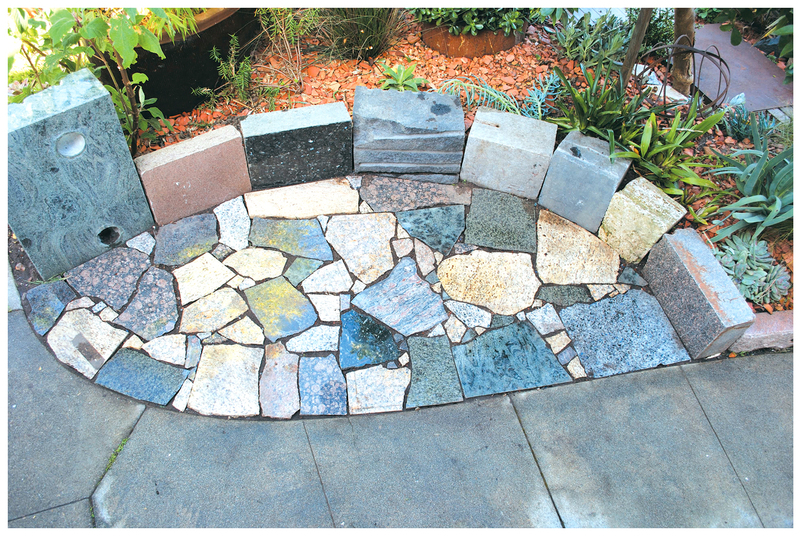 This small stone patio surrounded by a gracefully curved wall invites conversation. Multi-hued granite scraps (think kitchen counters) make up the mosaic floor; they’ve been grouted into position. Interestingly, the wall behind the patio is monument or architectural scrap, a material I’d never considered until now … Living next to the historic Evergreen Cemetery, many a monument has caught my eye … Now I’m wondering where they’re made, and how I can get my hands on some of these marble and granite scraps … I’d love to create something just like this, probably in my ‘temple’ area. Levesque will have me visiting local metal shops, too, to try and find similar attractive metal skeletons for use as screening. We have a wooden deck that would benefit from just such screening to hide our city-supplied trash containers. Finding skeletons with this type of graphic —and rusted — punch would really make my kind of statement. Here’s another view of the great patio in the first picture. I can’t stop looking at it … This is that type of book, you’ll look at it again and again, and see something new each time. The author’s ideas will trigger new ones of your own and it will really be hard to settle for off-the-shelf when it comes to garden accessories and materials. I mean, why settle for run-of-the-mill when you can have the satisfaction of the truly one-of-a-kind, and the pride that comes from doing it yourself? Levesque’s book is full of terrific tips and advice and he goes out of his way to instill in the reader the idea that the suppliers of these materials should be treated respectfully and cultivated. I enjoyed his admonishment to take care not to become a hoarder of these recycled/reused materials; cluttering up one’s property and creating an eyesore for the neighbors is not what this is about … Responsible reuse and repurposing, using only what’s needed for current projects, is the goal. The arbor again; I’ve got to find a way to tumble! … What I’ve shown are only a few of the projects included in the book, there are many more. But I think seeing these will have the same effect as they had on me: I want to create my own designs using recycled and reused items. I’ve done some already (my concrete core bench/wall, click here, for example) but my mind is swimming with others … it all depends on what great materials I can find out there. The book includes a short rescources list, but I’m on the hunt to find my own locally. Free tip: Craigslist as a very useful resource when looking for unusual commercial and recycled items; I’ve been able to find very interesting stuff through diligent keyword searches. 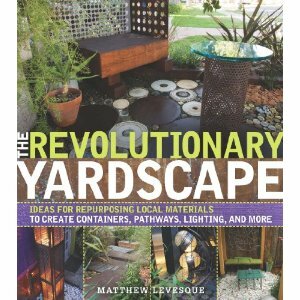 Matthew Levesque’s, ‘The Revolutionary Yardscape’, is available at amazon.com, here. Note: All photographs in this post are from the ‘The Revolutionary Yardscape’, Timber Press publishers, copyright 2010, and reproduced through their courtesy. Ok Reuben…please don’t hate me. I read this book and I just thought it was, well, not so revolutionary, or all that good. I think you pulled out all my favorite pictures here in your report. In fact I LOVE those metal skeletons, but how likely is it that we’d ever find them again? Honestly…I get more out of your posts than I did this book. Your blog and garden are more inspirational. Wow….okay now Matthew Levesque and Timber Press are probably going to hate me. I should have logged on anonymously. I don’t hate you at all, and not just because of your flattering comments, either. I really loved this book, especially for its function as a trigger. I don’t have expectations of finding the same materials, but similar ones that I can use in my own never-ending scheme … I think the author and Timber Press can handle differences of opinion, and I, for one, appreciate your honesty! Thanks for saying what you really feel. Hey, actually if you live near to an area were there is any real industry you should be about to find those steel sheets at the metal recyclers. The difficult thing is to get the shapes that you want. It’s possible, you just have to become a scrap metal rat. Scrap metal rat?! I’m ready to take on this title … And I love the hunt, I can’t wait to do some exploring! thanks for sharing the best of that book! i can’t wait for your garden tour. your scrappy vignettes (both literally and figuratively) are some of my favorites! Coolness, can’t wait to meet you! Just visited his Building REsources yesterday. Always try to make a visit when we come up to SF. The palms of my hands were bright orange from handling all the interesting bits. I knew his book would speak to you loud and clear!